Finally it's dress & anorak season! Although it's been super rainy around here, it's a welcome change to the wind and cold and I'm especially happy to shed my winter coat. This anorak is a favorite for Fall (see it styled here and here) and spring transitions and I love pairing it with patterns. Because it was warmer this weekend, I threw on one of my favorite striped dresses to offset the army green color. It's a Holiday weekend! And for some, like me, that means yummy Easter treats and spending time with family and loved ones. It also means that stores are having killer sales that you won't want to miss. I've chosen my favorite picks and sales that will be going on this weekend. I hope everyone celebrating has a blessed Easter! Statement necklaces used to be a staple of mine in my college years, but I have since made a switch to dainty jewelry for everyday wear. I feel that smaller less prominent jewelry is great for work and casual wear. However, this is not to say I have outlawed my larger jewelry all together; I use them sparingly when I want to make a real statement (pun intended). 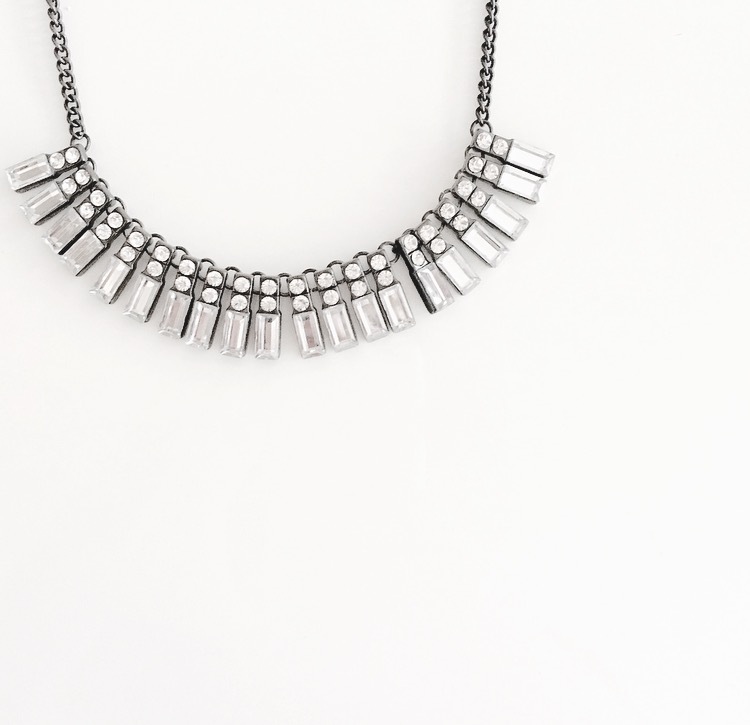 Whether it be for special occasions or to just to dress things up a bit, statement necklaces are a great way to take an outfit from blah to wow. This makes these pieces much more special and a treat to wear. I love mixing patterns that otherwise would be great on their own, but are even better together. This floral kimono has been a favorite of mine since last year, and now that the first day of spring has finally arrived, I felt obligated to wear it. Pairing it with these stripped wicker lace-up sandals makes it a little more fun and I especially love the tassel details. When I had the chance to check out Banana Republic's newest arrivals, I knew I wouldn't be disappointed. Upon receiving this beautiful petite Raw-Edge Peplum jacket, it was love at first sight. The subtle silver mint tone makes it the perfect pastel to style for Spring. The cropped fit hits me right at the waist (I'm wearing a petite size 4) with the perfect arm length. It's light weight for warmer weather but kept me from feeling cold during this particularly windy day. From up close, the delicate detail on it really gives it great dimension and although I opted for a more casual look here, I could easily dress it up with a skit and some heels. In college, I never paid my face much attention, and that meant falling asleep in make-up and not using the right products for my skin type. Fast forward 4 years later, and I am certainly paying for those days. I noticed a change in my completion not too far after and decided I needed to start giving my face a little TLC. 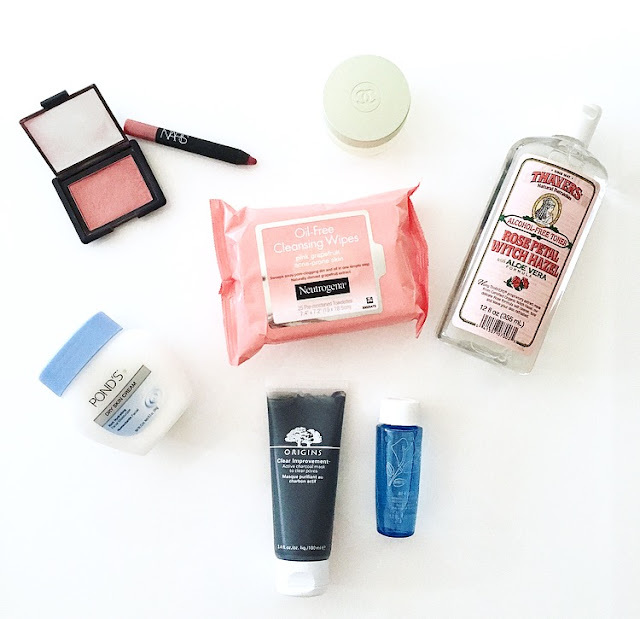 My beauty routine is pretty minimal, and I believe you don't need a whole tone of product in order to keep a healthy looking face (at least in your twenties). All of my favorite products are shown above and you can shop them through the links below if you feel they fit your beauty routine or you just need something new to try! 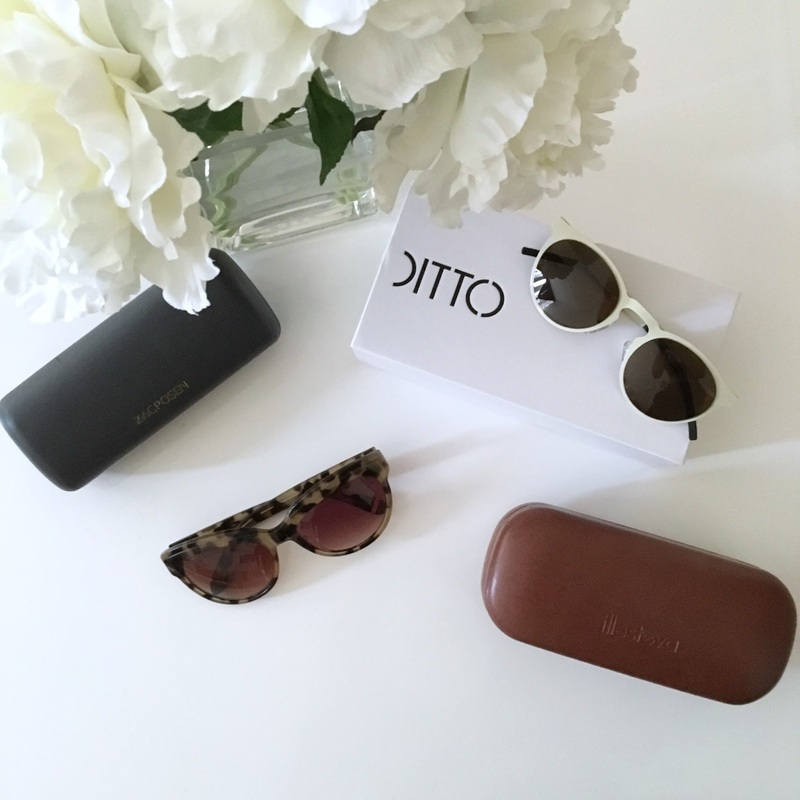 Some of you who have been following me know about DITTO's endless eyewear program, and have even tried and loved it for yourself! Since I have a few fresh faces around here, I'm going to explain exactly how it works. When you sign up at Ditto.com, you can use my code PLEASANTLYPETITE for your first month free. This is great is you want to give it a trial to see if you like it because you can cancel your membership at anytime. You can choose from thousands of prescription eyewear and designer sunglasses to be sent out directly to you, without paying the full price tag. After your first month using my code, it is only $24 there after to keep using their program and receiving and swapping their amazing sunnie styles. Once you are done with a certain pair, you just head back to Ditto.com, pick out a new pair and send the old ones back in. In my opinion, it's easy, convenient, environmentally friendly and definitely doesn't break the bank. In the case that you love a pair that you just don't want to part ways with, you are always able to have the option to purchase them. Give it a try! Let me know how much you love the program by reaching out to me below. After an amazing weekend celebrating my birthday a bit early (it falls over St. Patricks Day weekend and as any good Chicagoan knows, that holiday deserves a celebration on its own) I've decided to team up with some of my favorite fellow bloggers to give you all a little treat! I don't think I've been this excited for a Friday in a while. It may be my early birthday plans I have for this weekend, but I am genuinely ready to take a break from the work week and just breathe. When I was reached out to be apart of My Kitsch's Bun Pin Instagram campaign, I knew I couldn't say no after looking at their chic selection. I had never really thought of using a hair accessory like this, but have to say I am a major fan. I can't believe Spring is already here. Although, the month of March signifies this season, Chicago is holding onto Winter with a vengeance (currently 20 degrees outside). Even so, because this approaching season means being able to be outside, I have a bucket list of which I want to complete when nice weather finally does come around. Here are my top 10 Things to do this Spring. Head to Cindy's Rooftop - It's a fairly new place in the Athletic Association hotel, but I've heard nothing but good thing about this nautical-esq vibe rooftop and bar. Find a recipe that includes baked goods and Matcha green tea. A friend of mine recently brought Matcha cookies to the office, and they were the perfect amount of refreshing and sweet. I couldn't believe a cookie could actually be refreshing until I tried these. Buy fresh flowers from the farmers market. There are so many farmer's markets that start to pop up around the city when Spring/Summer hits. A few of the ones I want to try are the Federal Plaza farmers market and the Green City Market in Lincoln Park. Paint my studio apartment. Because I live in an older building, some of the aesthetic show the wear and tear of time. I would love to add a pop of color or freshen up the vibe. 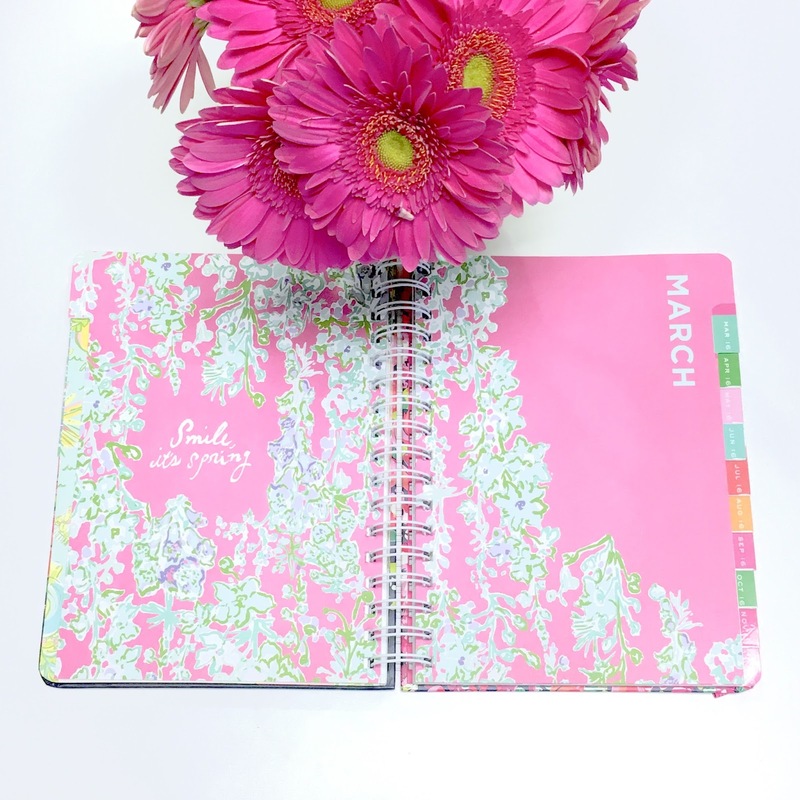 Make better use of my planner. 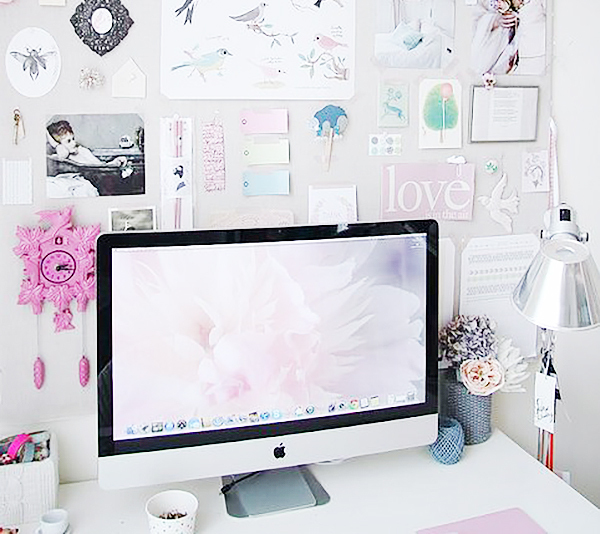 Things can get away from me and I want to do a better job at organizing things for both my career, blog and personal en devours. Try to master new hair styles. I sometimes tend to stick to one or two styles because of time or honestly I'm just too lazy to learn how to do more. I'm kicking this off Friday with a post on how to style a Bun Pin accessory from My Kitsch! Follow me on Instagram @pleasantlypetite to see two styled looks.